Why do you want to buy the tent? What’s the best size of tent for you? What’s the best material and build quality and how is this best suited to you? What season will you be using your tent? What sort of conditions will you be using your tent? What’s the most suited tent style and build for you? What value does the tent provide? What is reliability and durability of the tent? 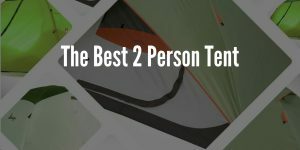 On the homepage I answer each of these questions so you can get an idea of the things I know are important to consider before buying a tent and that’s how I decide exactly the best tents of a category. Now let me explain what are my favorite 5 – 8 person tents and why I have chosen them and who they are best suited to. The most unique feature of this tent has to be the closet of course. There is a separate area which is attached to the tent that can be used as a closet. It can be used to keep clothing and some of your less bulky gear can go here as well. I really appreciate this feature because it means you have more room in the main camping area for comfort and accessibility because you shouldn’t need to store all your gear in the main camping area, a decent portion can be stored in the closet area or perhaps all of it if you camp light. This tent can be set up with 2 people in about 15 minutes and I would recommend having 2 people for the job. You can set it up solo but it’s going to take you up to 45 minutes for the task. One of the main benefits of this tent is the spaciousness that it provides inside. You can comfortably stand up inside without ever having to bend or hunch over, I’m 6ft and didn’t have any issues. It’s a cabin style tent and it’s one of the best cabin tents for 8 people. The waterproofing is great, the seams are inverted which is always a big advantage when it comes to keeping the water out. The first thing I would like to mention about this COLUMBIA tent is that the whole rain fly that covers the roof can be taken off. I absolutely love this feature because I love to star gaze at night so it’s a big plus. Not only does it offer star gazing but removing the top rain fly also improves the ventilation and of course lets more light into the tent, all of which I really enjoy. Speaking of ventilation there is windows everywhere, so you are always going to have fresh air flowing through which is greatly appreciated on those warmer days. The set up on this tent is also very simple, particularly for an 8-man tent. You can set it up alone in about 10 minutes. The instructions are very well laid out and easy to understand which can’t be said for all manufacturers so this is a worthwhile advantage. Of course this tent is massive inside and you can comfortably stand up straight and move around inside. This tent is an ideal size for a family of 4-6, that allows for room to store your gear and pets and also a little extra space to make your adventure that much more magic! 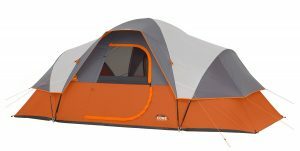 While this Ozark Trail is technically not an 8 person tent is has a very similar form factor and usually a very great value for money so, it is the best 10 person tent! As you may have imagined that space inside this tent is tremendous, it provides the most space out of any of these tents all for a competitive price. The seams: The reason I like to check the seams is because they are often a weak point on some tents of a lower quality and its usually where water can enter. The seams on this tent are very good quality and you will not be having a problem there. The poles: Pole quality can be poor with a lot of tents, the poles on this tent are strong and durable and just overall excellent quality. Rainfly: I like to check if a rainfly is included and its quality level. There is a rain fly included and its material is premium and I expect it to last a long time. 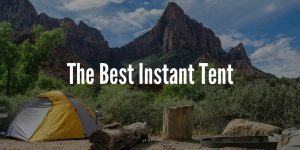 I just wanted to highlight this because this tent does an amazing job when it comes to all of the important aspects needed for any tent and that’s why it’s on this list. 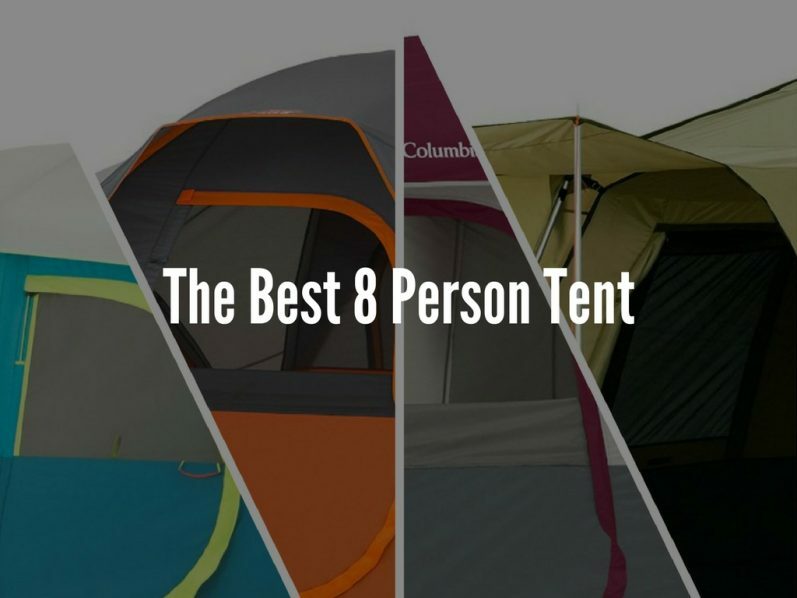 This is the first dome tent on this list. Well it’s not like a traditional dome tent, as they call it an extended dome and that’s a good way to describe it I feel. But don’t let its dome style full you because there is a tremendous amount on space inside, you will not be disappointed, in fact the opposite. 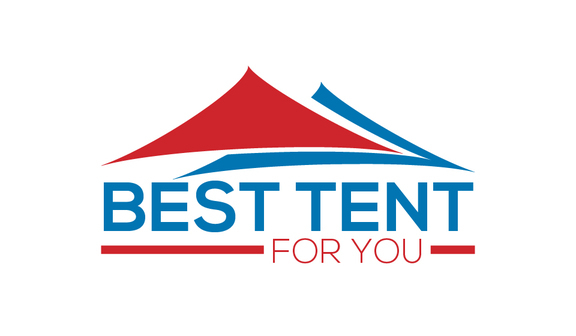 This tent is a great choice if you know it’s going to be windy, not only does the shape help with that but its overall structure and build quality are definitely able to withstand strong winds. Everything you will need is included with this tent including the tent, the poles, the tent stakes, the rain fly and also a carrying bag, all of which I was impressed with the quality they have provided. There is an included hook in the top middle of the tent where you can hang a lantern, I would definitely recommend picking one up like a – Camping Lantern, TaoTronics Emergency light. I would recommend going for one with at least 250 lumens of light illumination power. In the same spot top middle of the tent there is some additional storage, that is ideal for things like your keys or your wallet. One final thing to mention is that I love the design of this tent. The orange and grey work brilliantly together, it looks really classy in person. 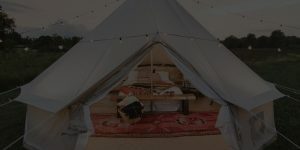 At the time of writing this round up this tent is the most affordable of the options I have selected, it offers so much value it’s hard not to recommend this. If you are looking for great value this should be top of your list! 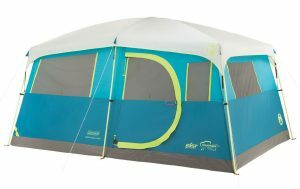 This tent is a more expensive option but is it still worth it? Absolutely it is, this tent is great investment, it’s going to last you for years and year to come. I would be surprised if it didn’t last you a decade, that’s how good the durability and quality of materials are, top notch indeed! If you are a family of <6 I would definitely recommend this as the experience and longevity you are going to have with it is going to be superb. Setup on this tent is very easy and fast, if only took me about 5 minutes to set up, it’s the fastest of any of the 8 man tents that I have tried (25+). I have endured a 2 hour thunderstorm in it and it stood up perfectly without a drop of water or moisture on the inside at all, very impressive. 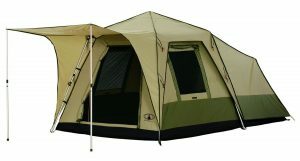 This tent comes with 2 rooms that can be separated with a privacy curtain. It’s the ideal thing if you are a family of 4 for example you can store you gear in the smaller room, it keeps things separated and makes you less likely to misplace something, that’s what worked best for me, it’s a great option to have. One final thing to mention about this tent is there is an awning which I really love, it allowed me to sit outside and remain protected from the sun all while being able to really take in my surroundings and enjoy the experience a whole lot more! If you are looking for a quality product that is going to last you a long long time this is the best option!